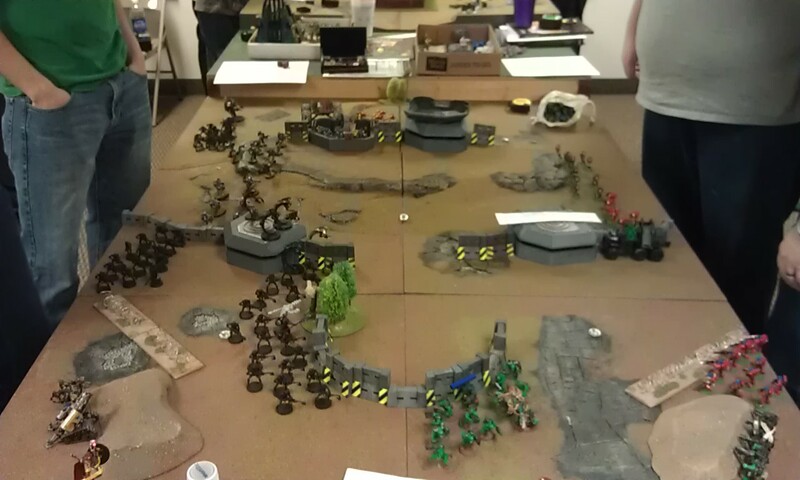 So, Kelly's Komix and I hosted a Team Tournament this Saturday - two players each with 1,500 points per player. Minimum point value for a list was 1,485. Scenarios were drafted and sent out to all participants ahead of time so they could know what to expect and what to expect in terms of having forces painted fully for the tournament. 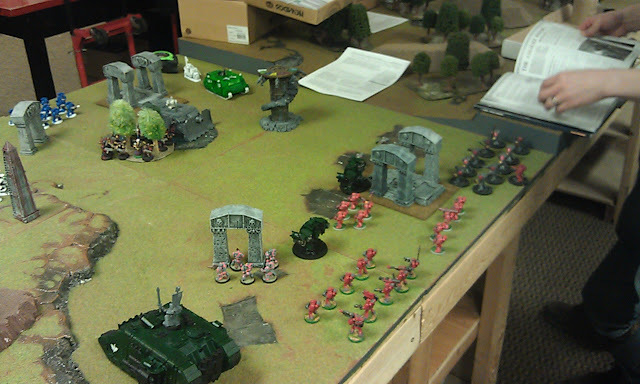 The result was 11 of 14 armies fully painted when they hit the table to the minimum of three colors, with the other three armies either primed and in painting progress, or with a few models which were still in the primer because the player was in the process of upgrading his army to a 1, 500 point force. In any case it was a fantastic time for everyone who participated - at least I hope it was. 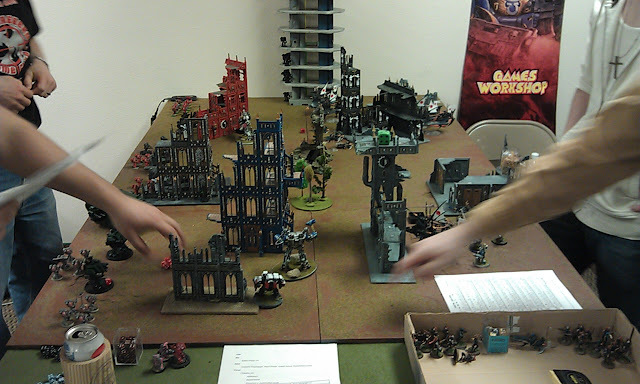 The scenarios were more balanced than they have been in many prior home-brewed scenarios, but they were also challenging to both sides. Nothing says challenging when the scenarios resulted in only a few teams earning major victories, and no team going fully undefeated in the tournament! So, in that vein the tournament was a smashing success and I felt that it went well. 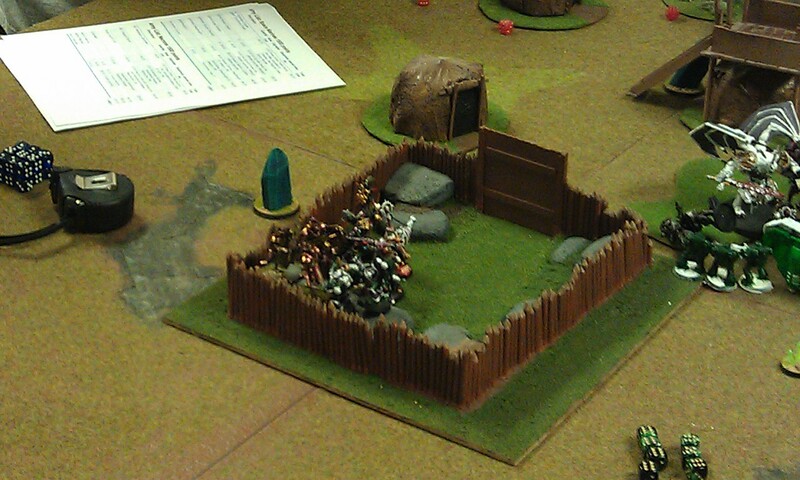 So, here are some photos with a bit of commentary! 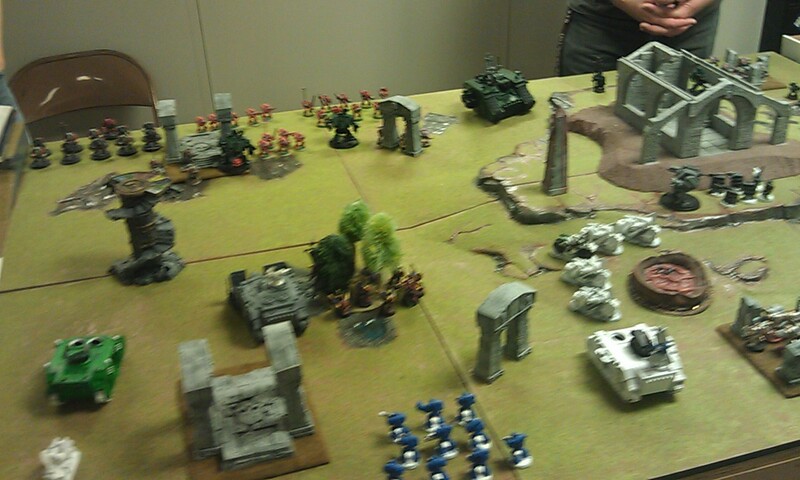 Steven, Scott, Kevin and Andrew battling for the ruins of an Imperial city. 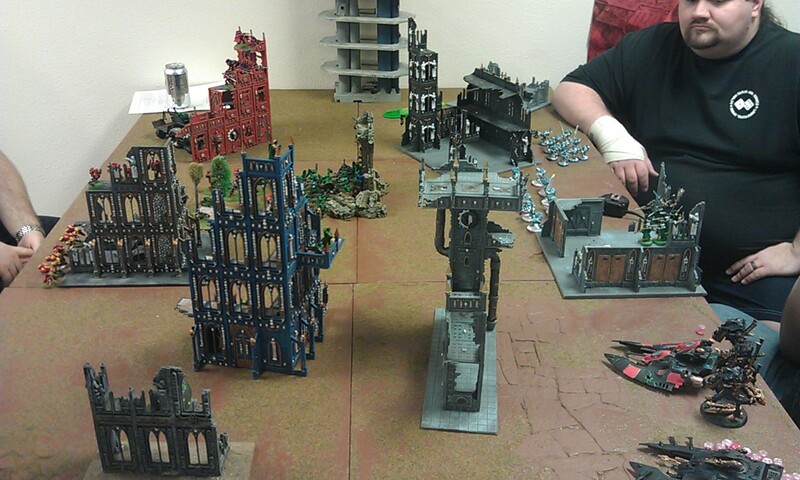 Another view of the Imperial city besieged by Dark Eldar! 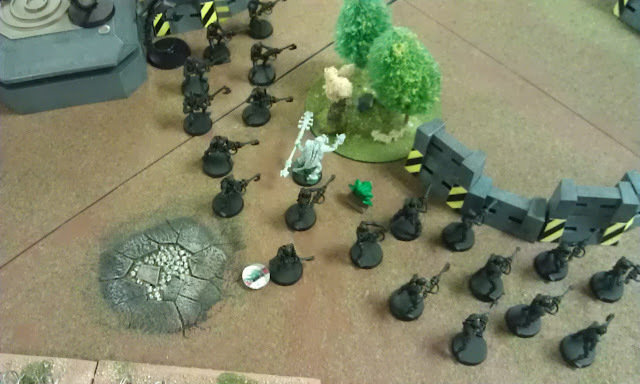 As you can see, the Grey Knights have been completely corrupted to join forces with the Dark Eldar - or they are combating some Slaanesshi horrors which have captured the city. 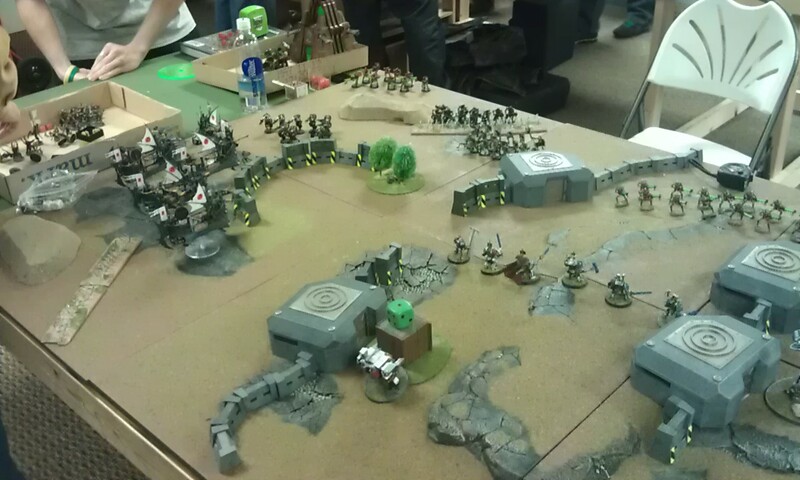 Eldar arrive on the table to fight to the death against the might of the Grey Knights. 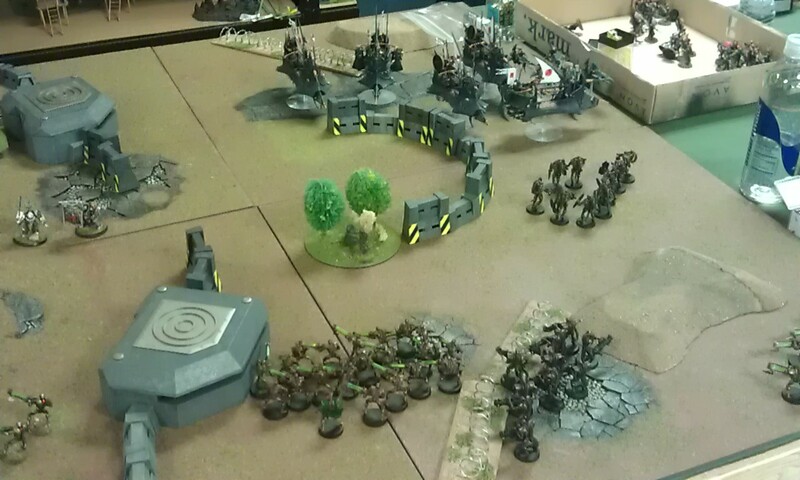 The Imperium's lines have been compromised and they have been forced to ally with Orks against the invasion of the Necrons! 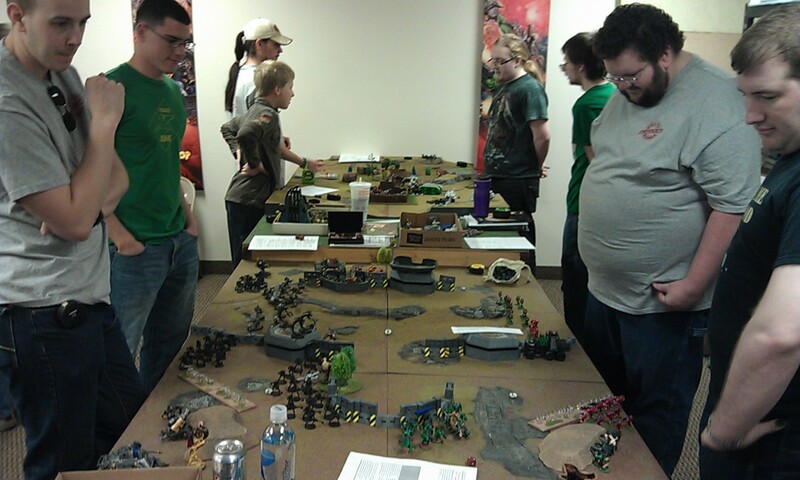 Here we see two tables in action at once - from right to left are Jason, Justin, Rylen, John, Jarred, Dennis, Matt and Josh, all of them commanding their forces and studying the positions and how to capture the objectives! 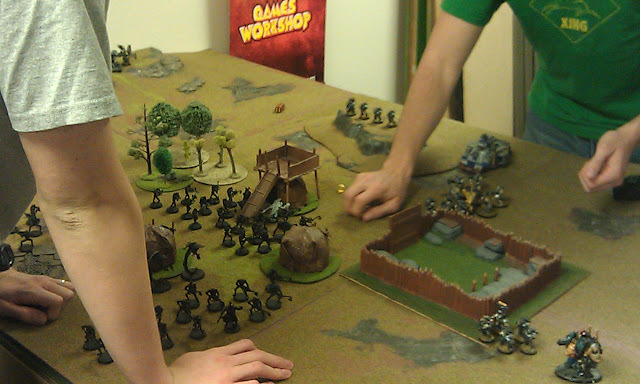 The two teams squaring off to fight to the death - since it was teams and not themed the players picked their force and their partner and then joined up to fight other teams. In this case we have Necrons and Space Marines against Orks and Blood Angels. A hard fought engagment - which ended in a draw if I recall correctly! 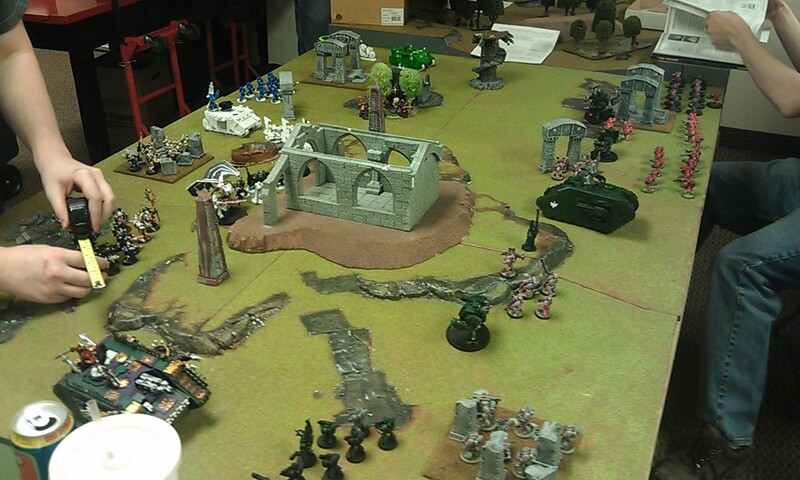 Chaos and Space Marines squaring off with the Necrons over a rural agri-world. 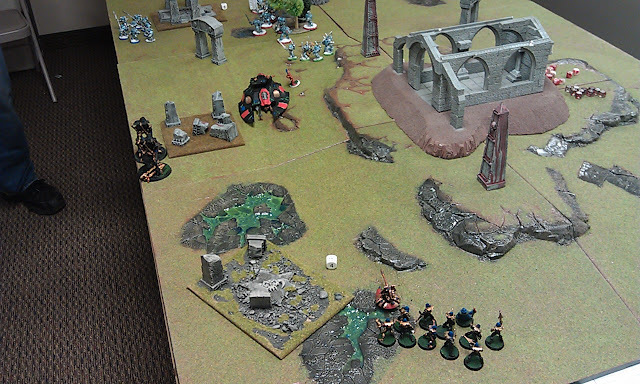 The Necrons emerged victorious by holding one major objective and contesting the other major objective and tying for control of the minor objectives. 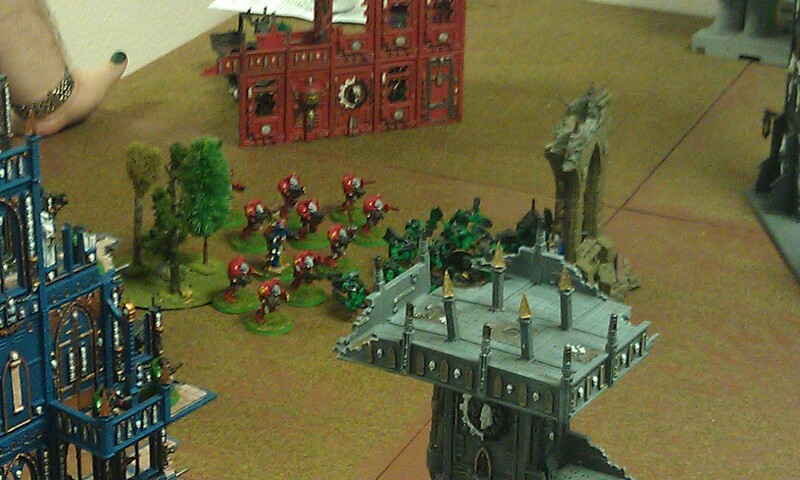 Space Marines being slaughtered in the courtyard by the Lychguard and Nemessor Zahndrekh. The greater Daemon and his allied space marines slaughtering the Necron Triarch Praetorians to a man! 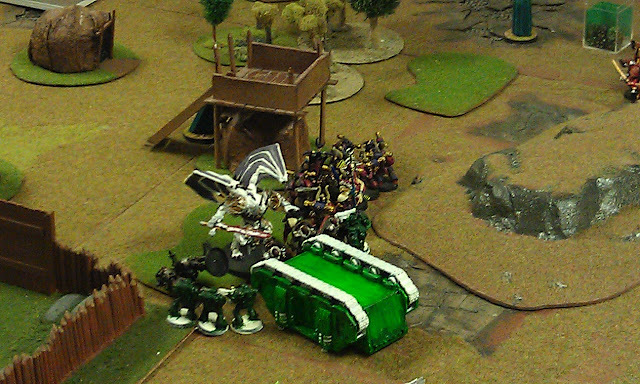 More Necrons moving forward to assault the fortifications - the funny part here is the green model in the middle of the Necrons next to the white basecoated Cryptek - that was the Necron Overlord before he got turned into a newt! Funny event! 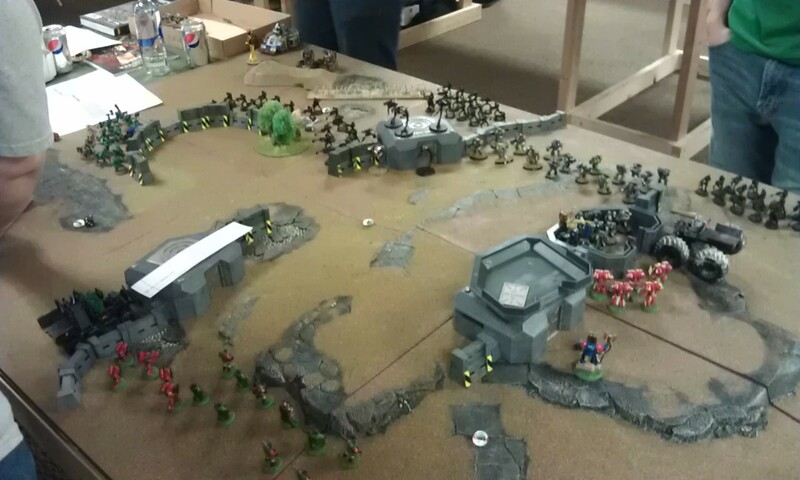 Felix looking grimly across at the incoming enemy army - he is seated at the right. The Blood Angels Terminators emerge to carve a bloody swath through their opponents! The dreaded Astral Claws being led forward by their allied Lamenter's commander Testiclees! 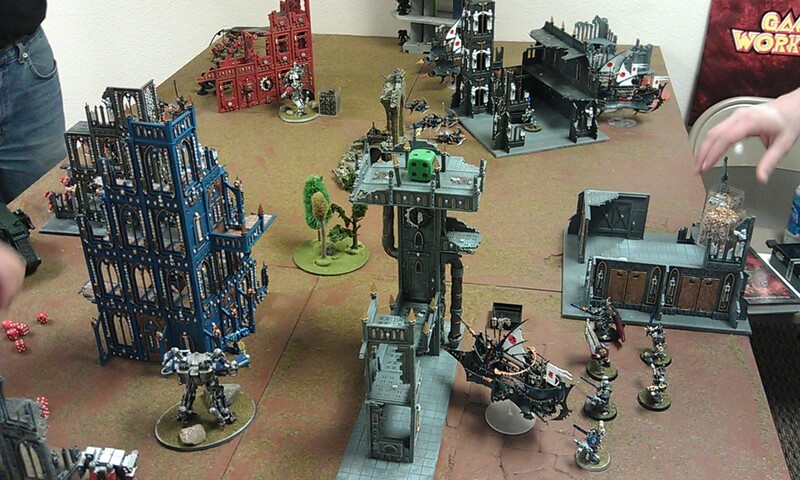 Custom dreadnought at bottom right is one of mine done for the store owner. It is a Chaplain with a custom lion head and many other modifications all done on a Bjorn the Fell-handed model, since the store already had one done for the store's Space Wolves army! 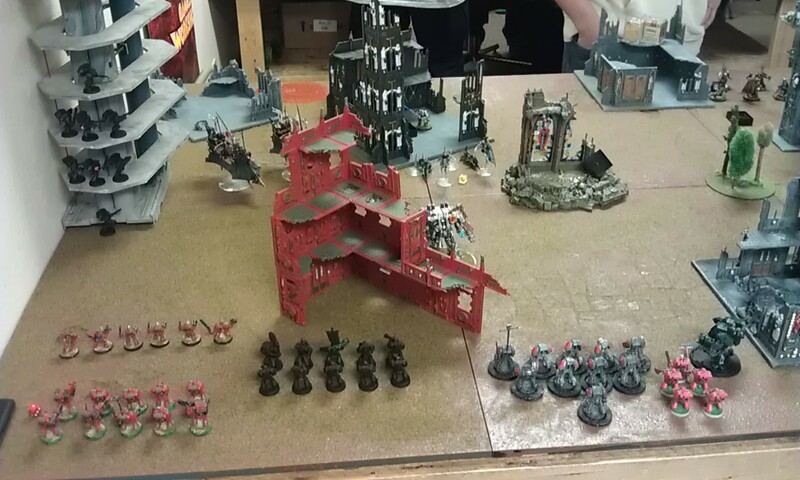 Grey Knights squaring off against the might of the Necrons - it was fairly one-sided, but the Necron troopers gave as good as they could against the Grey Knights with two Dreadknights and the Chapter master of the Grey Knights with a full compliment of bodyguards. Dark Eldar taking the Necrons down a notch or two - or did they? This side of the engagement was a bit more even with the Necrons destroying quite a few of the Dark Eldar forces and continually moving forward towards the objective. However, they failed in the end. Chaos and Dark Angels going against the opposing forces of the Imperium. Another view of the engagement - nice work on getting another player down to the tournament Scott! Thanks for coming Steven! A bit blurry - I was mugged by my kid mid-photo with a hug from behind as the SO brought them by on their Girls Day adventure! 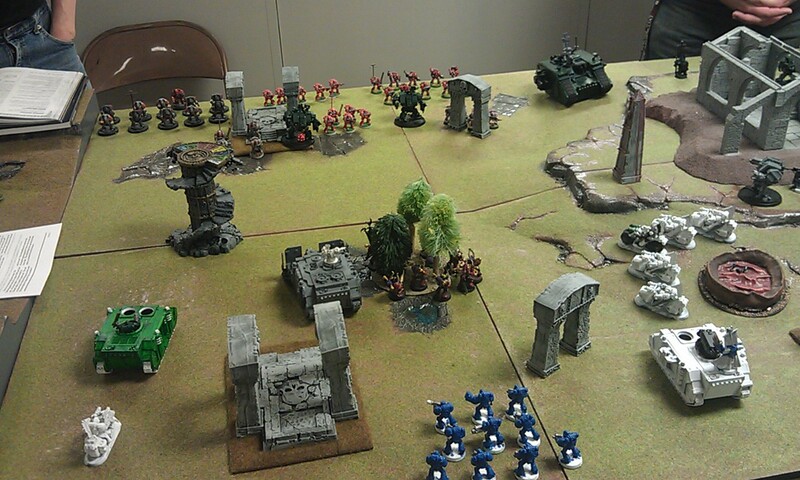 Blood Angels advancing on the Horde! 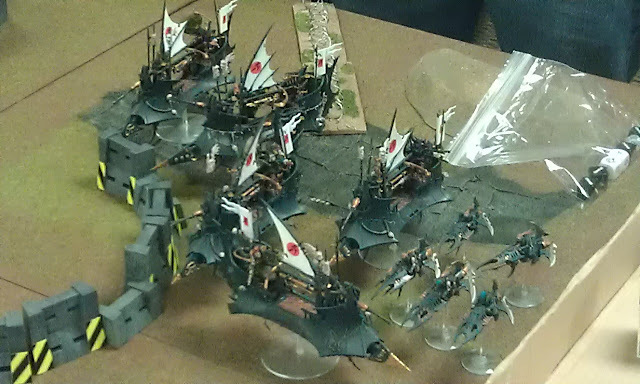 Kevin's excellent paintjobs on his dark Eldar - all of them were very, very nice. 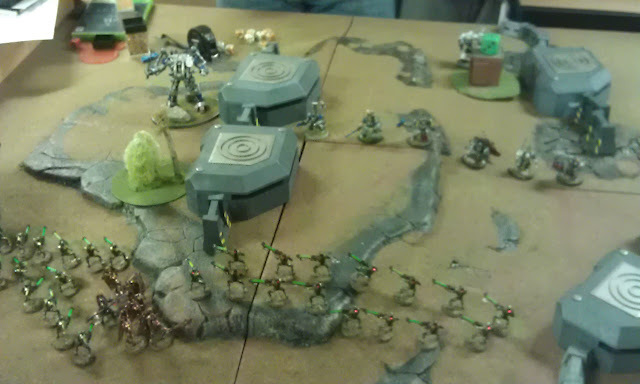 They looked great on the tabletop and they were quite effective too! My Necrons advancing against the Grey Knights again - the Monolith lasted one whole turn. 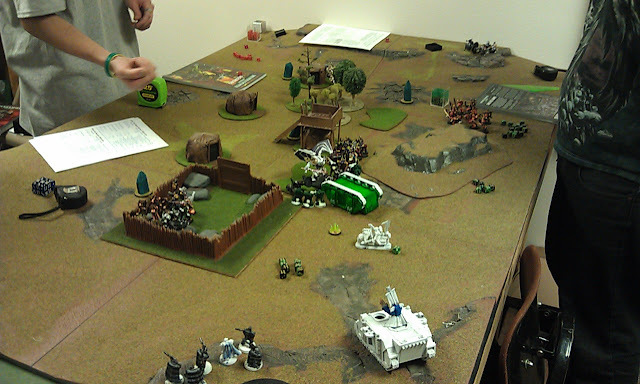 Was really a really ugly turn for my son - who blamed by daughter for rolling the dice for his opponent, Andrew. 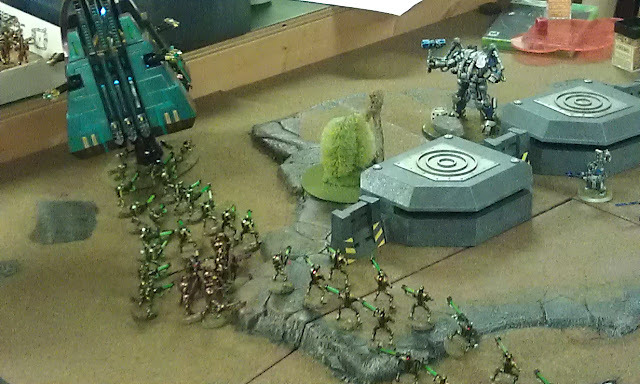 My Necrons being commanded by my son complete with the fully lit Necron Monolith! 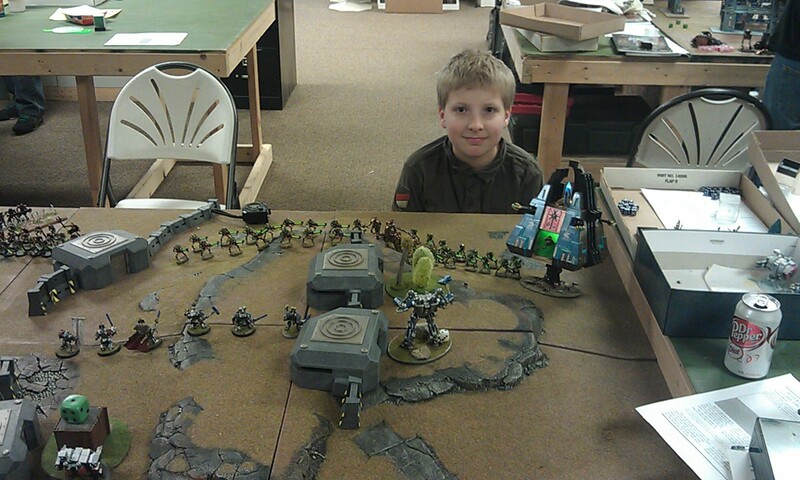 He was having a great time until his Monolith got blown up - he kept asking when it would re-spawn like in HALO - I told him it wouldn't. He was a bit peeved by that answer - but he got over it and his team still placed 3rd out of 7! A final view of the battles from the day before my phone was put away and the photos were left untaken of the third round! Sorry everyone if I didn't get enough photos taken, but I did try - and now you can share them or print them or whatever. Enjoy and happy gaming!